In the distant past the Upper Covington development was separated from the Lower Covington development and each was left to establish and operate their individual water systems. As you may know, the Upper Covington water system is maintained and operated by a volunteer group of your neighbors that make up the Board of Directors of the water company. 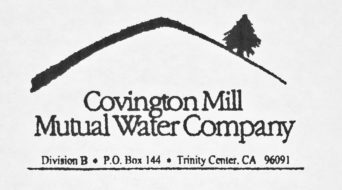 The current CMMWC Board of Directors extends its thanks and best wishes to the past group of volunteers who did a great job of maintaining and testing the water system, and keeping the financial books on tract. There have been many challenges to the continued efficient operation of the system posed to the current Board. The new Board members attended on line training sessions in order to learn about the laws regulating the operation of municipal water systems. The loss of John Wagner who performed water testing in the past meant that we no longer had a California certified water system tester, so the Board had to locate and hire someone to fill this position. The new tester worked out well for the 2015-2016 years but desired to move on. To fill the gap one of the Board members has obtained his certification and has volunteered to perform future tests. In addition to testing the system, John also maintained the records of system operation. Those records were stored in his computer and lost with the removal of his computer upon his demise. To further challenge the new Board, the system started having minor and major breakdowns. Modifications to the original operating system caused confusion to the operating circuits and resulted in malfunction to the electrical system. The Board made contact with Hays Pumps who (as it turned out) installed the original operating system. Hays Pumps began repairs and maintenance to the system. Unfortunately, the owner of Hays Pumps decided to significantly reduce the size of his company which left the CMMWC low on the list of his customers. With changes to Board positions and personnel, there was the further challenge of the loss of financial records. The Board is currently working to obtain a bookkeeper and auditor to gather the information we need to bring our financials current. The Board is faced with the fact that the water system is approaching 40 years of age. At some future date the system will need to be updated to include the installation of water meters at each shareholders connection point. The pump house is in need of replacement with a building that is resistant to rodents chewing their way through to the interior. The main piping will most likely need to be replaced at some point in the future. The Board had the storage tank inspected in 2015 and it was determined that the tank has about 10 more years of useful life, at which point it will need replacing. The Board also obtained a new stand-by motor and pump. Having this on hand will reduce down time of the system should the current motor/pump fail. We are attempting to have a WellTell system installed that will monitor water usage and recovery. The new Board volunteers continue to work closely with the regulatory agency that has jurisdiction over the distribution and use of water in California. They are currently seeking an outside contractor willing to travel to Upper Covington and see that the system is properly maintained and functions properly. The Board Members want to assure you that we are committed to providing services and Safe Water to you as owners of our system.